This artist impression shows the Rosetta spacecraft releasing the Philae lander down to Comet 67P/ Churyumov-Gerasimenko's surface. 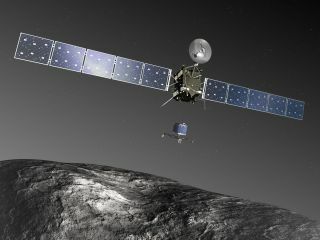 A probe is going to attempt an historic landing on a comet speeding through deep space next week. But Friday (Nov. 7), scientists are going to host a webcast discussing the bold work of soft-landing a spacecraft where none have been before, and you can watch it live online. The Rosetta mission's Philae lander is expected to make its landing on Comet 67P/Churyumov-Gerasimenko on Nov. 12. Friday's webcast will delve into the specifics of the mission with European Space Agency scientists. The Rosetta webcast is scheduled to begin at 10 a.m. EST (1500 GMT), and you can watch the Rosetta broadcast on Space.com via ESA. Viewers can participate in the webcast by using the hashtag #AskRosetta on Google+ or Twitter.